There is a wealth of talent out there and one of the things I would like to do this year is to raise the profile of new and emerging film directors and producers. Along with re-running the successful #DirectorShowreelDay on 26th July 2018 (put that in your diary peeps if you haven’t already!) I am going to be interviewing film directors and producers on a regular basis. Starting it all off is a great interview with British born actress Leila Kotori, who was the star of a short concept film ‘Nicola’s Shedim’ I wrote and produced as part of a feature film pitch package. Leila studied screen acting at Redroofs Theatre School, since 2008 she has appeared in numerous film and TV productions. Her most recent accomplishments include being cast as the lead in ‘Human’ the multi award winning short by Patrick Ryder, feature films ‘Set me Free’ (released 2016) by Kris Smith, ‘Fighting Heart’ (2017 release) by Lee Hampton and ‘Palatable’ (in production) by Hartfelt media Ltd. 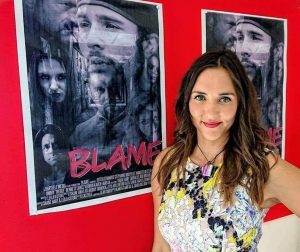 Behind the screen Leila has written and Co – produced the concept film ‘Blame’ (Hartfelt Media ltd), which is currently is currently in the draft phases of being written into a series. Beyond the camera Leila is an avid writer, currently writing her first novel, a urban fantasy story about two sisters who are thrown into a world on the brink of destruction. I would describe myself as very strong willed, anyone who knows me would say I am extremely determined, I do not quit, no matter how hard things get. If something doesn’t work one I will simply try another avenue. I am also very dedicated to each production I work on, I believe in being grateful for what you receive and so in return I give everything to each role I am fortunate to have. I was brought up in a family of women so I am very independent and headstrong, I know exactly what I want from life and I am not afraid to take risks and challenge myself, if I happen to fail at something I just learn from it and try again. But I am not all business, I love to have fun, when on set I am always trying to have a giggle, as much as I have a vision for where I want to be, life, is also there for living. It’s all about finding the balance even when busy….something I am still learning to do. What made you get into film making and acting? What was the moment when you thought that this was what you wanted to do? I had always wanted to act since I was a small child, performing is my passion but it wasn’t until I attended university to study Geography that I truely realised I wanted to pursue Acting professionally. It was a gut instinct that I could not shake and I knew I would massively regret not following my true desire. 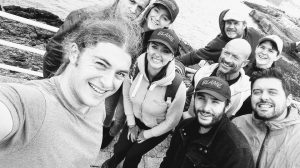 I knew I needed to complete my degree as I was half way through the course, so I decided to gain some experience through local theatre companies over the course of my final year. I then knew I needed to get some professional training, I did not want to spend another 3 years studying drama and though I love theatre, there was something about Film that always captured my attention. The ability to visually create an entirely new world, to completely change the appearance of an actor beyond recognition that it fully engrosses you into the story and that world! I knew then I wanted to do a course in screen acting. The course I did also trained us in the work that goes on behind the camera, what goes on either side of the camera is equally important to the production as a whole. Over the years I have worked on both sides and I have to say the thrill of simply being on set and bringing to life someone’s vision is like nothing I have ever experienced before. I get that thrill everytime. What films have you been in? And what was the last film you made? I have been in various films over the years from shorts to features. 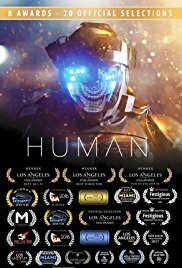 The short film ‘human’ by Patrick Ryder has recently gained 500,000 views on youtube, which is just incredible that so many people world wide have seen this story. The last bit of filming I did as an actor was in February for the trailer ‘Mrs Plonkers sitcom’, this has now been given the green light to produce the pilot episode in November so I am incredibly excited to start on that. It is also the first bit of comedy I have done. Aside from acting I have also made what was originally a short film called ‘Blame’ (with Hartfelt Media productions), this has now turned into a concept film for the ‘Blame’ Series which will consist of 8 episodes. 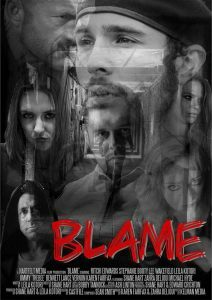 ‘Blame’ was the first script I have written and I was incredibly fortunate to have my good friend Shane Hart (of Hartfelt Media) agree to direct and produce. At present the first episode is staying in the can until I have completed the rest of the season which is currently in its 3rd draft phase. But I am incredibly excited for this to get into production, with everything though patience is needed! Again something I am still getting to grips with! My biggest achievement has to be ‘Human’, half a million people viewing the short on youtube is one hell of an achievement, I know the whole team are super proud. Not mention the film has won multiple awards. Plus writing and co-producing ‘Blame’, from concept to finish was a year, as my first film I am over the moon with the finished production. I don’t think you can ever forget your first film, getting it from as seed of an idea and then seeing it on the big screen. It is thrilling! What is your latest project about and who is involved? Are there any links? ‘Blame’ is about Eight people leading very different lives, hit desperate times in a world of corruption and drug culture ruled by The Don . The mayhem surrounding their life choices unravel as they support each other in seeking a release from their turbulent nightmares/Daymares. They create what they believe to be a safe, therapy style environment where they can support each other when no one else will. But fate has a different idea for them! We have a great cast attached to this production as well as myself there is Lee Wakefield as ‘The Don’, Ritchi Edwards as the ex soldier ‘Will’, Lane Paul Vernon, Jimmy the bee Bennett, Stephanie Booty, Karen Fairfax and Shane Hart. What is your plan for it? Festivals? Cannes? We had originally planned to send ‘Blame’ as a short off to festivals but we have decided that as it will be pilot for the series it must be kept from public viewing for now. If there are distribution plans for your film, how will you go about this? We are currently considering if ‘Blame’ will be pitched for a TV series or produced as a web series. So I cannot say more than this right now. How do you go about building an audience for your film? Firstly you need to think of the age of your audience, what age group would most likely watch your film, what type of person. From there you can socially market to that category with appealing content, this can be through posters, recorded interviews, blogs, vlogs, teaser trailers. You want to build momentum and appeal with your audience until they are literally gagging to see what you have made. It is all in the marketing, so many films are made these days with no end game and little to no marketing, you want people to be talking about your film way before they see it. With social media thriving so much there is no reason why you can’t affordably market a film. You work to help other film makers through networking. How have you done this and what tips would you give to someone starting out? I have recently started making vlogs and I will be covering tips about the industry there, I am still learning but I would like to think I have some pearls of wisdom to pass on to someone starting out..
Networking is a huge part of working in the film industry, so often alot of success is is not only based on talent and hard work but also who you know. You should be connecting with people daily, there are also alot of social networking events that are posted on many acting/filmmaking pages which are always worth attending. Jokes aside I know I will be working full time as an actor/filmmaker, I know that in my heart, there is no doubt. Doubt can kill dreams, so don’t ever let it in!